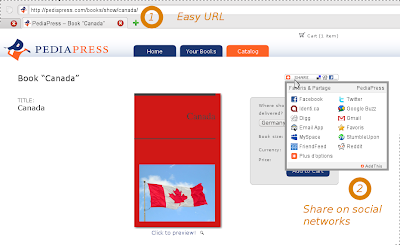 PediaPress Blog: Book Sharing Made Easy, Who Will You Share Them With? Book Sharing Made Easy, Who Will You Share Them With? With this whole chocolatey atmosphere around us in the past few days (this is Easter marketing for you in Europe), we thought that it was time to add to the sharing. Sharing of books, of course, since we don't really do chocolate online. So We've been working towards adding a few easy shortcuts for you to share your custom books with your friends through social networks such as Facebook or Twitter, or even by email. Sharing in short, in as many ways as possible, with as many people as possible. 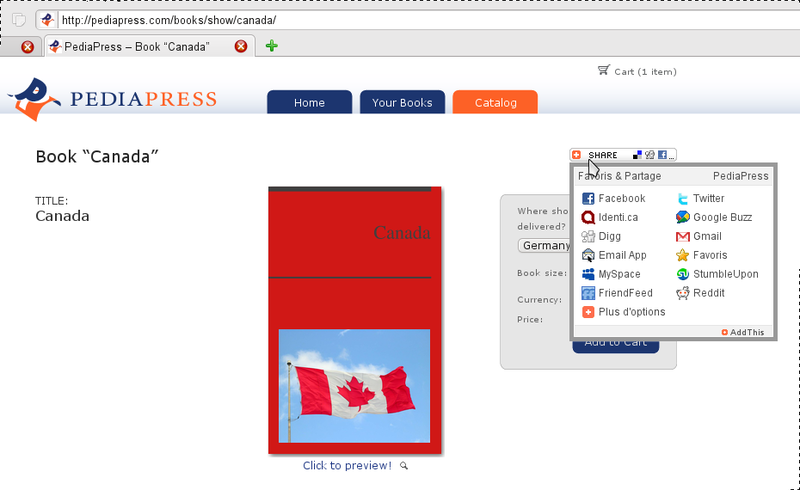 You will now find a [share] link present in various places while you're browsing the pediapress.com website. You can find the first one on the upload screen. 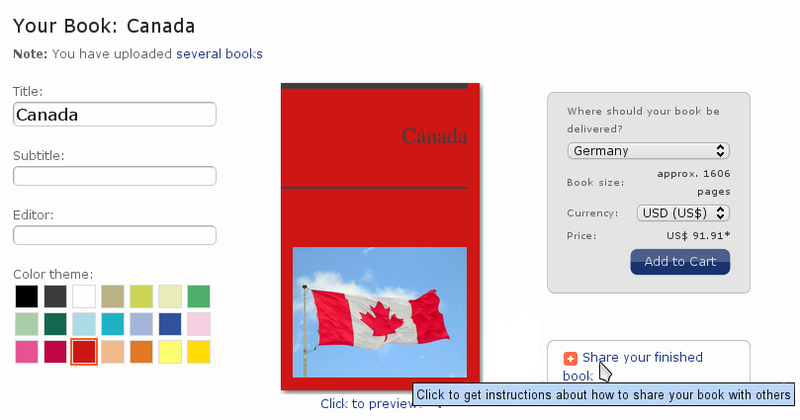 Once you've customized your book, you can click on [share your finished book]. This will prompt a dialogue which will ask you to confirm that you want to give your book a url which will allow you to share it easily. Note that once the book is shared, you won't be able to edit it anymore. 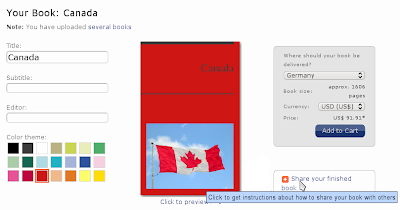 The action of [sharing] will give your book a set url of the form http://pediapress.com/books/show/name-of-your-book which you can then use to advertise your book around. We've also added a share icon to the visualisation screen. When you've generated the easy-to-share url, you can click on your book and you will find a" share" icon which allows you to send your books to popular social networks such as Facebook (where incidently, you can become a fan of PediaPress), Twitter, identi.ca, delicious and more. As a bonus, we also now offer a practical way to go back and manage in a neat list the books you have uploaded to PediaPress [*] through the "Your Books" tab at the top of the PediaPress website screen (between "Home" and "Catalog"). So now that we've made it easy for you to share your books, who will you share with? Your colleagues to show them the books you made with all the articles you wrote on Wikipedia? Your friends who are interested in the same topics you are? Your parents to make sure your next birthday gift is a book you really want? The travel companions that are coming with you on your next holiday to the other end of the world? Well, I suppose all of those are options and more. In short, we are counting on you to make sure the wiki spirit of collaboration and togetherness lives on by sharing your custom books with the world. On the contrary to chocolate, to use and abuse is good for your health :D.
[*]Note that this feature will be enhanced in the next version of the pediapress.com website when we launch user accounts. For now, it works with cookies, so will only work on the one computer you used to upload your books and if you have not erased your cookies.